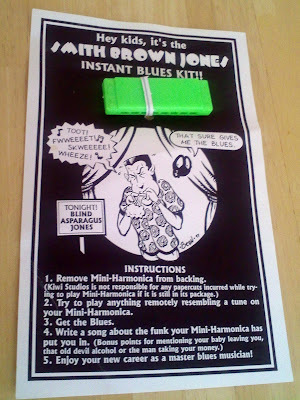 Waaaaaaay back in 1998, my friend Mick introduced me to Smith Brown Jones. It was a very funny and clever comic by a gent named Jon "Bean" Hastings and was one of the first non-superhero books that I started buying. I'd read plenty of my dad's indie-type books but this was the first I sought out and purchased on my own. I recall that Hastings had put a call out somehow (probably in the back of one of his comics) that he was looking for new/different/interesting music that he could play while he was drawing. I sent him a CD of a band called Brand X, a jazz fusion group that released a handful of albums in the late 1970s. I think I sent a copy of their first album, Unorthodox Behaviour, which featured Phil Collins, Percy Jones, John Goodsall and Robin Lumley. 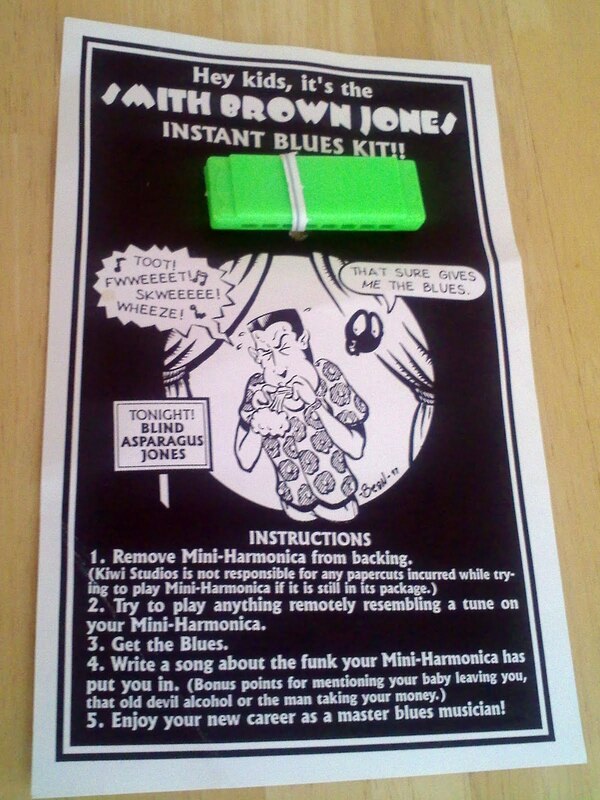 Try to play anything remotely resembling a tune on your Mini-Harmonica. Enjoy your new career as a master blues musician! I don't know how many of these Hastings actually sent out over the years, or how many are still around, but it's definitely a treasured part of my comic collection!